Got an earache? 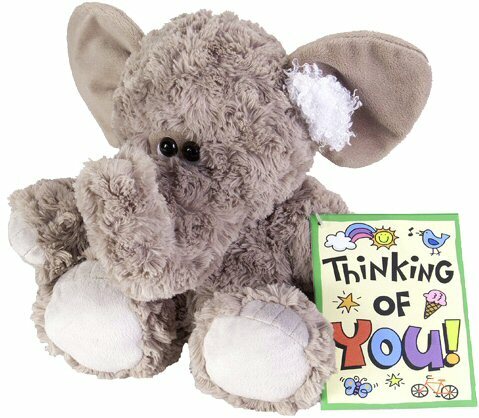 This adorable plush elephant from the "Get Well" Buddies collection can certainly understand. In fact, he wants to see to it that you feel better by providing lots of cuddly comfort and support. With a wad of white "cotton" in his big floppy ear and a huggable body of soft gray fur with a wild black tuft on his tail, this sweet earache elephant stuffed animal offers his special brand of medicine in the form of soothing hugs and constant companionship. Includes a colorful Think of You! card for personalization. This sweet sniffles teddy bear offers cuddly comfort and soothing hugs with soft tan fur on a huggable body. This adorable little plush elephant keychain has soft blue fur, pink accents and a sweet face. Blueberry, this adorable Li'l Sweet & Sassy stuffed elephant, has soft blue fur and beautiful lavender accents. Plush elephant Elate has soft frosted gray fur, white toes, large floppy ears, and sweet black eyes. This adorable little Handfuls stuffed elephant has soft gray fur, floppy ears, and a sweet face. This adorable Elephant fabric wall art is a wonderful addition to any safari, zoo, or other animal habitat theme.